meeting attendees review answers to a quiz on Burleith history. On Thursday evening, June 16, more than 40 Burleith residents filled a classroom in the former Fillmore/Corcoran school to hear representatives from the BCA’s Historic Designation Committee, DC Office of Planning, DC Preservation League, and the community discuss the pros and cons of historic designation for Burleith. Built primarily by developer Shannon & Luchs in the 1920s–1940s as a distinctive rowhouse community marketed to “the buyer of moderate means, but of more than ordinary good taste,” Burleith may be a candidate for historic designation. The town hall meeting was part of the community information and outreach process required by the city before a historic designation nomination can be submitted. According to the Office of Planning’s website, nominations must be sponsored by the “property owner, Historic Preservation Review Board (HPRB), a government agency, Advisory Neighborhood Commission, or organization which includes in its by-laws the purpose of promoting historic preservation.” If, after consultation with the community, the BCA determines this is something the community supports, the BCA would submit the nomination. History Quiz. Burleith’s history and architecture were highlighted by a quiz and handouts distributed to attendees during the pre-meeting refreshments. Enlargements of building photos, period advertisements and newspaper articles, and DC Office of Planning maps of Burleith architects, developers, and construction dates lined the room and offered clues to the answers. Historic Designation Committee co-chair Carol Baume reviewed answers to open the meeting. Welcome. BCA president Eric Langenbacher welcomed attendees and thanked Sachiko Kuno, CEO of the S&R Foundation, for hosting the meeting at S&R’s new studios and for providing refreshments. Overview and Why Now? Historic Designation Committee co-chair Lenore Rubino's presentation covered the purpose of the committee and the impetus for considering historic designation now. She said that in 2005 the BCA board discussed historic designation with the community but at that time, the costs of pursing designation were somewhat prohibitive, and fundraising would have been necessary. In order to let residents receive tax deductions for their donations, the BCA decided to form the Burleith Community Fund. By the time the BCF was formed, the BCA’s attention was diverted to the Georgetown University campus plan negotiations, which ultimately required GU to house more students on campus. The recent investor sell-off of Burleith property is a direct result of the BCA’s efforts in the campus plan negotiations. This sell-off has prompted an increase in development in Burleith with accompanying third-floor build outs and rear additions. Rubino suggested residents take a walk through Burleith and think about how they would like the community to look in 10 years. The walk could involve comparing the relatively unchanged north side of the 3700 block of S Street with examples elsewhere in the neighborhood of third-floor additions that have changed the streetscape and examples of rear developments that did not change the streetscape. Historic Preservation and Designation. In her presentation, Kim Williams, an architectural historian and National Register Coordinator with the DC Office of Planning, covered the purposes of the DC Historic Preservation Law and the benefits of designation, stressing that it allows community involvement in “managing change.” Historic preservation review helps ensure that change is compatible with the historic character of the district. Williams defined “compatibility,” a key preservation concept, as “harmonious,” noting that compatibility does not require matching or copying the original. She showed examples of acceptable and unacceptable juxtapositions of old and new. Noting that most exterior alterations, including doors and windows, already require a permit, she explained that historic preservation review is part of the building permit process for additions, alternations, or repairs to the exterior appearance of a historic building. Routine items can be handled “over the counter,” she said, although substantial changes require review by the HPRB. In the case of such substantial projects, the ANC may weigh in on them and present its opinion to HPRB. Williams spoke about Burleith’s rear alleys contributing to the character of the neighborhood; therefore, large build outs which overshadowed neighbors’ properties would most likely not be allowed, although build outs in keeping with the neighborhood would be. (Up until this meeting the HD Committee was under the impression that large rear build outs would be permissible. As Williams spends more time in the community, she is assessing contributing and noncontributing factors.) The vast majority of Burleith properties occupy much less than the allowable maximums. This means that anyone can put up third floors and make large additions to any part of their house, without regard to impact on neighbors or aesthetic fit. Houses can also be demolished (with a permit) if the owner decides to do so. She concluded by describing the designation process: conducting research and compiling information on the history and architecture of the neighborhood; conducting community outreach and educating the community about historic district designation; and preparing and submitting an application to the DC Historic Preservation Office for review and a hearing before the HPRB. If the nomination is approved, her office would work with Burleith to develop design guidelines. Economic Aspects. Peter Sefton, chair of the landmarks committee of the DC Preservation League, briefly discussed some of the economic benefits of historic designation. Dissenting Views. The agenda included two residents, who presented concerns or objections to historic designation. Walter Hillabrant of 38th Street noted that he liked the contemporary buildings on R Street (between 37th and 36th) and other additions and expansions that would be prohibited under historic designation guidelines. He also objected to being told what he can and cannot do to his property. Sheila Hegy, also of 38th Street, focused on what she felt were higher-priority issues for Burleith, such as upgrading the housing stock and reducing the number of unrelated persons living in a house. She said she didn’t want to discourage young families from moving to Burleith. The town hall, the second of three planned meetings on the topic, concluded about 8:30 pm. The first meeting was held at Washington International School in February as part of an unrelated discussion and vote on renaming Ellington Field. A third is planned for September. Composed of Carol Baume, Lenore Rubino, Ann Carper, Alex Frederick, Eric Langenbacher, and Gwen Verhoff, the HD Committee invites residents to email comments and questions to hd@burleith.org and to visit the Exploring Historic Designation web page for updates and more information. 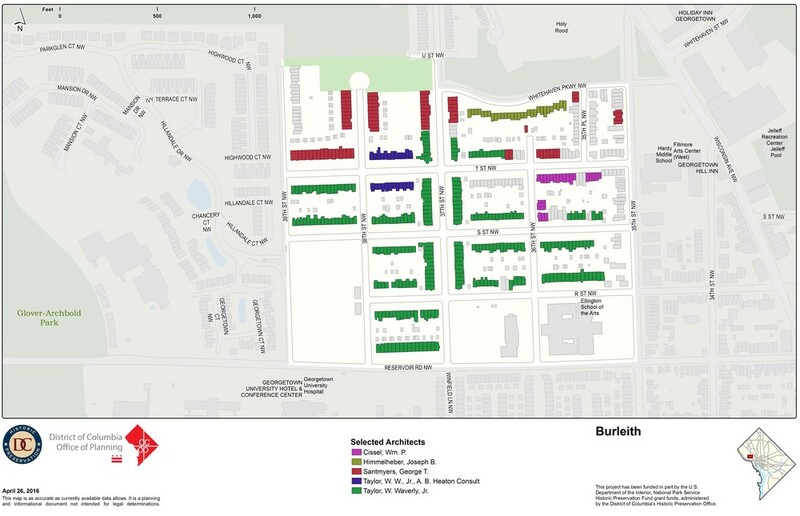 This planning map shows the various architects who designed most of Burleith.